The name Mandora a synthesis of Mand(-arine) and ora(-nge) which has been given after considerable thought to this hybrid of a superb quality fruit developed by cross pollination of the two varieties. It is Mandarin Orange of a rather flat shape of deep orange colour. The pulp is tender and extremely juicy often exceeding 60% of the whole fruit's weight. The juice is of outstanding colour, while the flavour is extremely sweet but well balanced with acidity and has a strong, rich aroma. It does not develop delayed bitterness. It's skin is tough and the fruit contains seeds. Mandora is an orange x mandarin hybrid that is cultivated in many countries: Spain, Morocco, Cyprus and South Africa among them. Each country has given its own name to the fruit. In Israel it is called Or and Topaz, in Cyprus it is Mandora and in South Africa it is Tambor and Orri. Mandora can be stored at cool temperature for a day or two, but then should be stored in the refrigerator crisper or drawer, away from vegetables for up to two weeks. 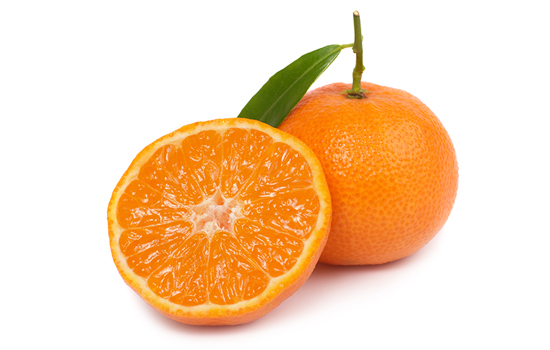 Mandora have a bright orange color, rich, sweet flavor and are easy to peel and section or used in salad.